Cristiano Ronaldo is spotted after having a bloody collision during a match against Deportivo. The “Real Madrid” star is wearing a bandage over the corner of his eye, which covers the laceration that he got during the previous game. 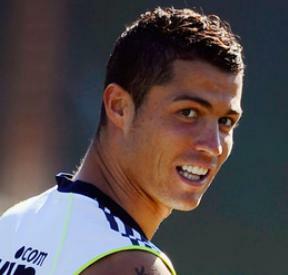 He seems okay while having a workout at the practice field in Spain. Aside from the bandage, the soccer star is in good spirits and he is wearing orange “Fly Emirates” shirt and also the blue one. Meanwhile, Cristiano suffered a bloody injury when he scored a goal during final few minutes of his team’s game in Sunday. He looked annoyed after checking his face using a team medic’s phone and realizing the damage. His team won the game after scoring 6-1 lead in the 84th minute.